it’s only been recently that I feel compelled to see it on the big screen. Now that I’ve heard a little more about it I’m kicking myself for not going when I had the chance, and am hoping to find the time to see it before it’s out of theaters. Normally I try not to hear anything about movies before I go to see them as I find expectations can ruin a movie for me, but I had a couple friends who were really impressed with it, and since I didn’t have any intentions of seeing it anyway I decided to look up a couple reviews and see what other people were saying about it. So far all of the feedback I’ve heard has been positive, and it’s actually started to really pique my interest without divulging any spoilers. According to the internet, not only is the writing good (which is a huge selling point for me) but apparently the character development is good, something which is more rare in suspense/thriller movies such as this. 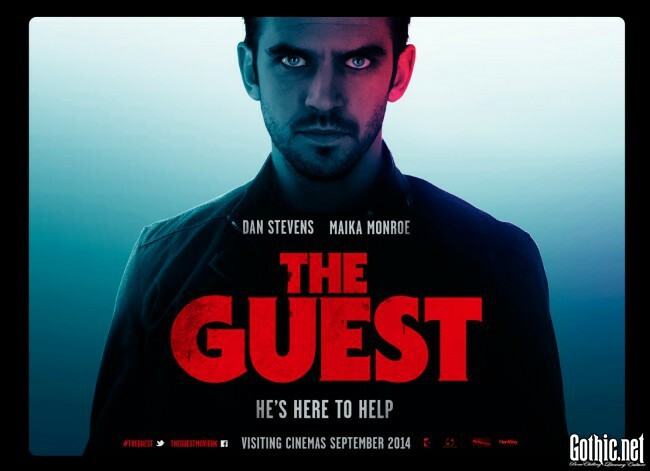 “The Guest” was directed by Adam Wingard, who also did “You’re Next” which I just finally got around to seeing last month and really enjoyed. There were a lot of twists in it, in addition to having a lot of tension which are both things that aren’t always easily executed in movies, but done very well. I think applied to a thriller like “The Guest” they could be even more effective and I’m really looking forward to seeing another movie by him. In regards to the actual movie, the premise is one that doesn’t sound particularly unique, but could definitely have a lot of potential. David (The Guest) shows up at the house of the Peterson family to tell them about his experience fighting alongside their recently deceased family member in the war. He stays as their guest to fulfill a promise he made to his fallen comrade to help the family in any way that he could. Things soon turn sinister as the family encounters a string of dark events following David’s arrival at their home. From what I’ve heard, the trailer doesn’t do the film justice, but I’ve included it at the bottom for those of you who, like me, haven’t gotten a chance to see the film yet. It’s a title that I’m really looking forward to, and I hope it’s as good as the reviews say. Posted by Cat Voleur on Thursday, July 23rd, 2015. Filed under Movies. You can follow any responses to this entry through the RSS 2.0. You can skip to the end and leave a response. Pinging is currently not allowed.